If you got an iPhone 7 or 7 Plus then you know the problem that the phone only has a lightning connector and that means you can listen to music or charge but not both at the same time. But worry no longer because we found a cable that will offer you both options at the same time. 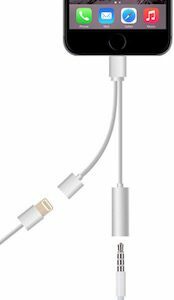 Just plug it into any iPhone with a lightning connector and you will have a 3.5mm headphone jack and a lightning port at the same time. No need to buy an Apple phone dock because this does what you want and it is portable so easy to take everywhere you go. Come and get your 2 in 1 Lightning Cable With Headphone Jack And Charge Port. If you have lots of friends that you want to share your music with then we found the coolest gadget for you. 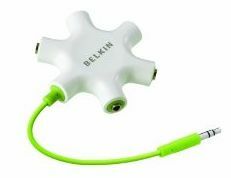 The Belkin RockStar will let you share you headphone port of your mp3 player with 5 people now you can all chill out on the couch at a coffee shop and enjoy the same music. We all get this problem once in a while. You want to share you sound with a friend but you don’t really want to share you headphones. Now with this little Robot you can share you music but with using your own headset. This is ideal when you sit on a plane and you neighbor want to see you movie on your iPhone just plug in the Splitterbot and you are ready for two headsets. It does not need anything just plug it in to your device and plug in two pairs of headphones. So no batteries are needed. Just go check out the Splitterbot and see how handy it will be on your next trip.